moves to discussing UK Biometric Identity Project, which was scrapped in 2010. Argues that Aadhar claims to achieve the same objective - detect illegal migration, fight terrorism and prevent identity fraud for welfare. Reads various objections to UK Project by MPs. Then @KapilSibal says that Sec.3,4,8,57 in addition toS.7 need to be struck down. Argues, S.57 allows making Aadhaar mandatory for non-welfare services even by private parties. Says that even if Sec.7 not there, then State can make Aadhar compulsory under different Statues (cont. 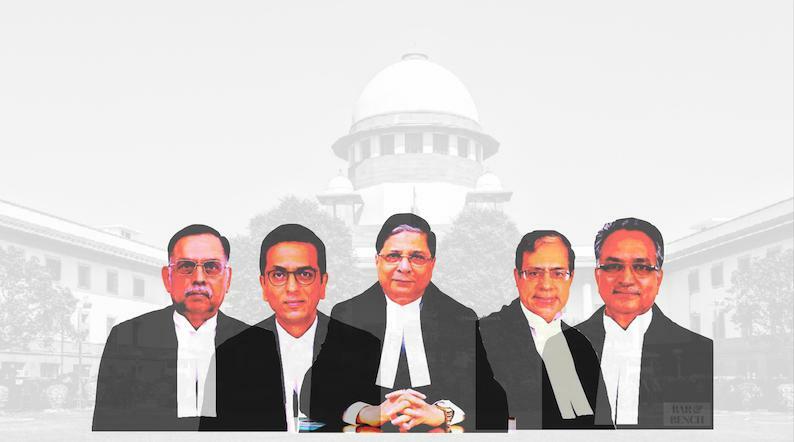 #Aadhaar: Supreme Court Bench assembles, Justice AK Sikri pronouncing his judgment now. #Aadhaar: Justice AK Sikri has authored judgment on behalf of himself and CJI Dipak Misra and Justice AM Khanwilkar. #Aadhaar: It is better to be unique than the best, Justice AK Sikri starts his Aadhaar judgment. Aadhaar has become the most talked about expression in the recent years. Day 20 of final #Aadhaar hearing to begin shortly. Attorney General K.K.Venugopal, appearing on behalf of the State will commence his arguments. AG: Various expert committees have examined Aadhaar, and other alternatives were also considered before Aadhaar was decided upon. Says world bank approves of Aadhaar project. #Aadhaar hearing. @PChidambaram_IN continues arguments for his petitioner Jairam Ramesh, challenging the Aadhaar Act on the ground that it was incorrectly certified as a Money Bill. 1991 4 SCC 699...Subcommittee on judicial accountability v. UoI being read. Explains the difference between various phrases such as : final, conclusive, and "shall not be questioned in any court". ...such satisfaction was held to be subject to judicial review. Similar reference to Kihoto Hollohan case where final is distinguished as beyond appeal..but not beyond review. #Aadhaar hearing. Arvind Datar, Sr. Advocate appearing for MG Devasahayam and others, petitioners. Briefly Shyam Divan and Arvind Datar press for interim directions. CJI promises to hear once A-G is here. A-G is now here. But APD has started arguing. He says he challenges Bank Aadhaar linking. He says he challenges all notifications under Section 7, PMLA Rules, Section 139AA of IT Act. APD showing how the new PMLA rules are contrary to RBI circulars issued earlier. Aadhaar Day 8. Bench assembles. Kapil Sibal to continue. Kapil Sibal says that just this morning there is a report about how in old age homes across the country, people are being denied pension because of Aadhaar. He says "this is the reality of India." Sikri J says that government has claimed that 1.2 billion people have been enrolled, which means that only ten crores are left. He asks if there are so many problems, how have so many people been enrolled. #Aadhaar hearing. Bench about to reassemble. Kapil Sibal to continue arguments for some of the Petitioners. KS clarifies his point on 8 (3)(c) and says it is 'completely wrongly drafted' with respect to "alternatives"...because for authentication, according to defintion, there is no scope for alternatives. Sikri J and Khanwilkar J are not so sure. Insist there are alternatives available. (Me thinks: Totally unnecessary and irrelevant discussion).